Virginia advanced to the Final Four in thrilling fashion, beating Purdue in overtime to secure the win. Let's break down each moment that made Mamadi Diakite's unlikely game-tying bucket possible. Diakite's back tap got the party started. So how did it happen? It probably wouldn't have been possible had Diakite not been sharing the floor with 6-10, 250-pound bruiser Jack Salt. 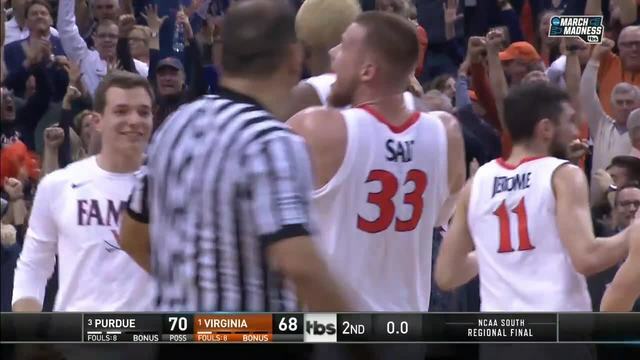 Diakite and Salt don't typically play together, but Tony Bennett opted to go with two traditional bigs late. And it paid dividends on this play. Matt Haarms (listed at 7-3) was Purdue's only true big man in the game and he boxed out Salt. That left the 6-6, 220 pound Grady Eifert on Diakite. And Eifert had no shot against the large, athletic Virginia big man. Side note: it helped that Ty Jerome clanked the free-throw so badly. You usually don't see long rebounds like that off of free throws, so all Diakite had to do was jump and use his long arms to tap the ball into the backcourt. Plenty had to go right merely for Virginia to gain possession after the miss. Jerome is a 74.4 percent free-throw shooter on the season. Asked if he missed the free throw on purpose, Jerome quipped, "I made the first on purpose." In Purdue's defense, it's tough to be prepared for situations like this. When Diakite tapped the ball back, the Boilermakers' natural instinct was to chase it. It would have been wiser to sit tight and reset defensively. Kyle Guy played a big role in this play, intentional or not, as well. He called for the ball from Kihei Clark, who wisely pushed it up to Diakite. But two Boilermakers sprinted to Guy, which was the reason why it was Haarms vs. two Cavaliers. And you can see why. Purdue, in real time, was probably worried about the 3-pointer. Had Clark passed to Guy, it would have been a deep heave. But a shooter as lethal as Guy easily could have sent Purdue packing with one look. He finished 5-for-9 from beyond the arc so it was wise to keep an eye on him. You're not expecting Salt or Diakite to beat you from the perimeter. But, as we'll dive into in a moment, sometimes guys defy the percentages. Even head coach Tony Bennett didn't process the right decision as quickly as Clark. "Ty was clapping. I was like, throw it to Ty," Bennett said. "We'll get one up there. For Mamadi to catch it and get it off that quick, it was so improbable. We've had amazing games here and amazing comebacks. I was almost in shock a little bit." Clark has serious jets and this play couldn't have happened without his elite speed and smarts. Watch the play again, and you'll see how fast he's moving. Diakite only had a few tenths of a second to spare on his tying shot. Clark is the guy on Virginia who was capable of executing this part of the play. The pass was outstanding, too. Clark could have thrown it to Guy, as we mentioned before, but he identified two Boilermakers scurrying his way and fired a bullet to Diakite instead. Clark was like a quarterback facing a blitz and he split the two safeties without flinching. "Kihei made the play of the century and Mamadi was ready to shoot," Jerome said. "Actually, let me add, he looked Kyle off first and then looked me off. Then he got to Mamadi over here, and he made a great play." Again, with such little time, every little mile per hour on that laser of a pass mattered. The ball left Clark's hands with about 1.8 seconds left, and Diakite caught it with 0.7 ticks remaining. The ball traveled about 45-50 feet during those 1.1 seconds. Clark put some much-needed mustard on that pass. It was accurate, too, landing in a perfect spot for Diakite to hoist his arms and fire. Had it been a little to the right or left, or up or down, Diakite A) may have taken too long to adjust, thus not getting the shot off in time; or B) missed because of the extra body movement. Clark's pass was absolutely perfect in every way. “Just had to advance the ball as quickly as possible,” he told Andy Katz afterward on the decision to throw the ball to Diakite and look off Guy. This all leads up to the shot, which was unlikely in itself. Diakite is many things as a player: a rim-protecting, dunking machine who's an excellent two-way cog for the Cavaliers. But he's not known as an outside shooter. Diakite actually has better touch than you'd think upon first glance, but it's still not a huge part of his game. He's shooting a respectable 71.4 percent from the free-throw line on the year but has only attempted 14 3s. So Diakite should not reasonably be expected to make a 17-footer without time to gather himself and get in a good shooting motion. But, with 0.7 seconds left upon the catch, it was onions for the athletic big man.